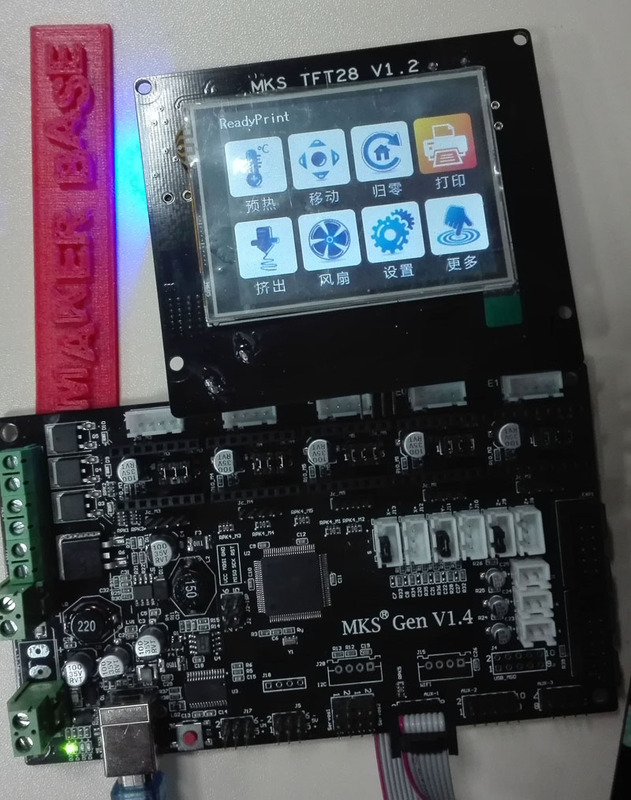 MKS-TFT28 and MKS-TFT32 color display Touch screen is designed to control RepRap Open source 3D printer. 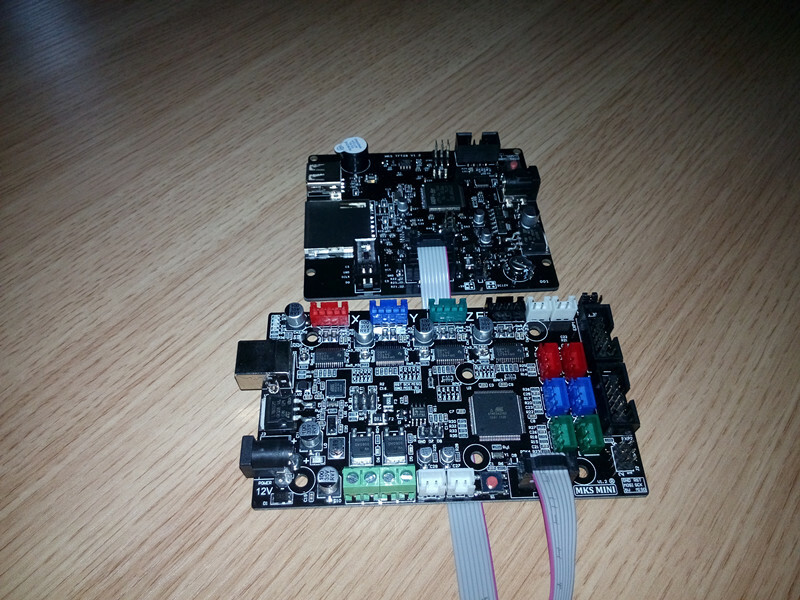 It can work with MKS Base, MKS GEN and MKS MINI series 3D control board. 4) Start-up Logo and UI can be customized. 5) Printing:Put your 3d module data file into the USB storage or SD card and put it into MKS-TFT28 or MKS-TFT32 , your 3D printer will start printing shortly. is it possible to connect MKS TFT32 to a RAMPS 1.4 ? Please download the Arduino IDE version 1.5.X to test the board. What are the changes in the configuration for the the MKS-TFT32 display? I am using the latest version of Marlin 1.1 RC8 and I want to keep using that version. I did that and it appeared to apply properly and I recompiled Marlin with the #define REPRAP_DISCOUNT_FULL_GRAPHIC_SMART_CONTROLLER uncommented. I uploaded Marlin but it is still not working. Any other settings? Which board do you use? Are you willing to provide the Marlin Marlin 1.1 RC8 to me and we’ll test the marlin? Which configuration do you want to change? Pls formate the SD card and install the marlin and MKSTFT_Firmware again. I reinstalled Marlin and the LCD drivers twice. Still the exact same problem. Could my board be defective? 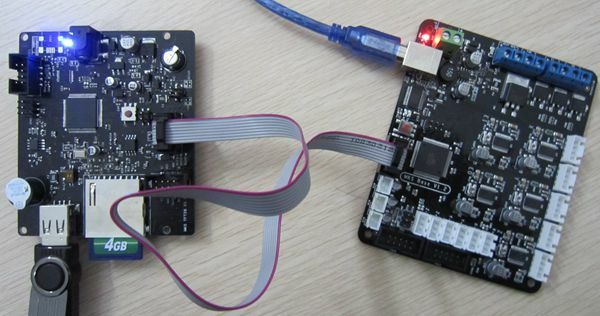 We have tested the board and find may be you use wrong interface to connect with board. You can know more about connection on the link: https://www.amazon.com/OSOYOO-Controller-Combination-MEGA2560-RAMPS1-4/dp/B01J9ZVPZU/ref=sr_1_32?ie=UTF8&qid=1484033807&sr=8-32&keywords=Arduino%2B3D%2Bprinter&th=1. That link is just the Amazon listing. What exactly were you trying to tell me? I’m using the latest Arduino IDE and Marlin 1.1.0 RC8 if that helps. It seems to make a difference if you use Mac or Windows to format the card and copy the files. I used a Windows machine and things worked. I use an iMac and had the same problem with the weird icons. I found that the problem has to do with the filetype .bin which is copied in a specific way on a Mac. In the end I copied the files to the sd-card via the terminal command “cp -X” (https://developer.mbed.org/users/takuo/notebook/copying-bin-files-to-frdm-kl25z46z-using-cpmv-comm/). Worked for me! There are two interface at the back of LCD, Pls confirm you connect with motherboard interface. Using windows rather than mac to tranfer the files solved the issue. I don’t know how that fixes it, but whatever works. I just wanted to add that I was having this issue and following this step solved it, at least for me. I had tried to update the MKS-TFT28 firmware before installing Marlin, and that’s when the odd images showed. I installed Marlin and then reinstalled the MKS-TFT28 firmware and all is back to normal. 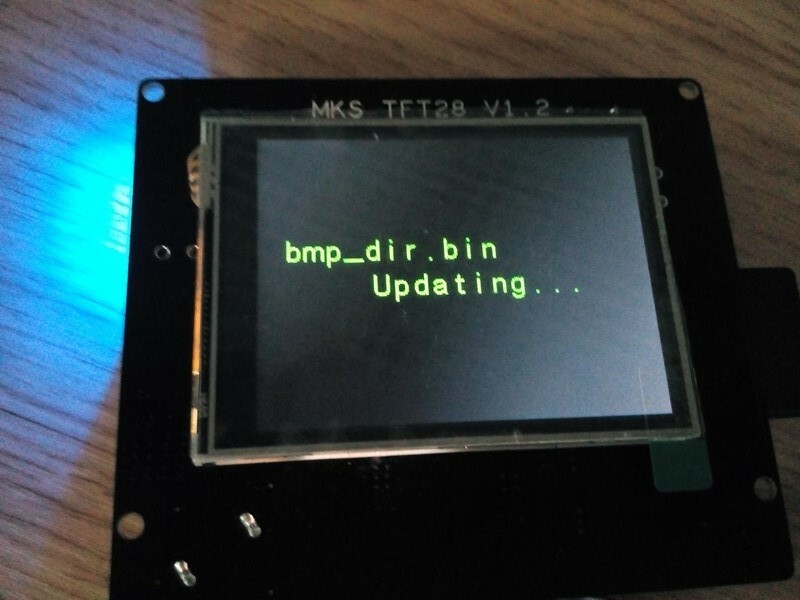 Do you copy the MKS-TFT28 firmware in a SD card and a USB disk and insert it in the TFT28 LCD? Hello, i’m using TFT28 on RAMPS 1.4 , is there any way to make it work when i print from computer ? to display temperatures and other info like 12864 graphic LCD does ? i’m not sure if you understand, the TFT28 works fine if i print from SD card. but if i print from COMPUTER through USB the TFT28 remain in main screen, does not show temperatures , fan speed or progress of printing like other lcd displays. is this a limitation of TFT28 or a defect ? what can i do ? Hi. I’m using the MKS BASE V1.5 with an FLSUN Delta printer. is there marlin firmware for this board that is configured for a delta printer? Do you config the Z anix according to the instruction? All seems to be working but the z travels 3cm instead of 10 mm and the x and y don’t travel far enough. please help. Pls change the code in configuration.h. You need to adjust the appropriate distance between the extruder and level. I have a MK Gen board, a TFT28 and a WIFI module. When the wifi module is plugged into the TFT28 and power is applied to the Gen board nothing happens. Without the wifi the Gen and the TFT power up no problem. Is this a firmware problem? Or a power problem. Right now I am on the bench using USB cable to power everything. Hello, I am new at this but I’m interested in getting this board. The bed I want to use is 24 volts, and I know the board can accept 24 volts however, I was wondering if the Watts mattered in this instance? I was also wondering if I was putting in 24 volts then would the extruder also be getting the 24 volts or would it bring it down to 12? The board accept 15A as max currency. mks base tft 32 Support smoothieboard? Do you mean the MSK base/GEN/SBASE board? but The MKS tft32 LCD can’t support ramps board. mks base tft 32 Support smoothieboard v1 board Support? Hello. I purchased MKS SBASE V1.3 + MKS TFT32 3.2” LCD Touch Display. Please help me to connect the display to the base. Menu is working, but info from the base not receive. 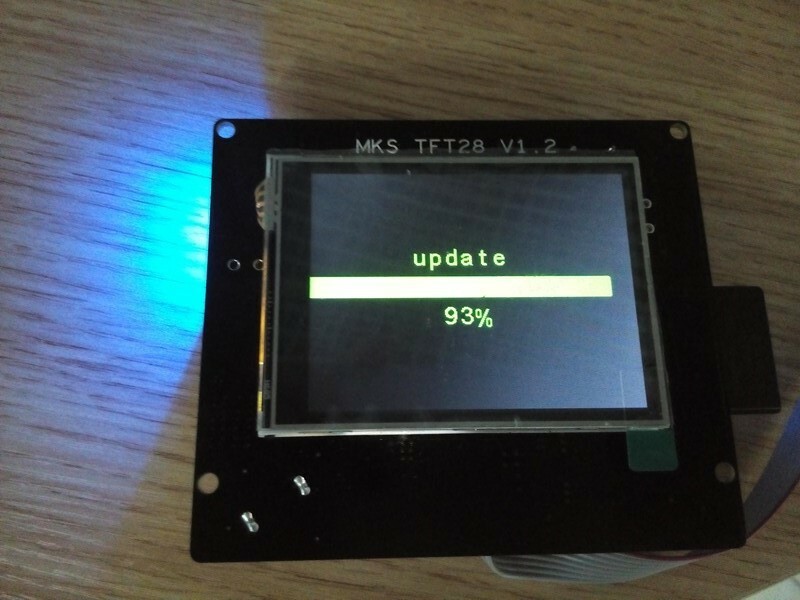 I have the MKS SBASE V1.3 & MKS TFT32 3.2″.After updating the firmware I noticed there no long has the ‘Set>Connect’ icon. How do I change the baud rate now? Or even see what it is set to. This entire set up has been nothing short of a nightmare! I haven’t seen this screen preform a single task yet. Literally nothing outside of changing the icons and removing menus. Other icons shows on display? It’s your firmware (the newest). Just forget it! After reading all these comments it is painfully obvious that you never answer any questions with useful information. All the answers have come from either people who figured out there own problem or customers answering customers. I’m just going to return this piece of junk and buy and actual Smoothieboard. At least they have customer service and documentation for their own products. I’m sorry. As we need to know more details about the issue and to test with our 3D printer. We have updated the firmware last week, are you willing to try it again? I have had my parts in and working well for some time now but the controller developed a problem with the 12 volt output recently. I finished one print and set it to start another and walked away while it was warming up, but when I came back a little later and noticed it still wasn’t running I checked and neither the hot-end or the bed was heating up. Whipped out the voltmeter and there was 12 v. in but no 12 volt coming out to the heater or the extruder. What is the process for warranty replacement? Which board do you use, MKS BASE V1.5 or GEN, Or SBASE? mks base tft 32 Support duetwifi board Support? Today I got a MKS TFT 3.2 in a bundle with a MKS sbase. I connected it with the AUX1 ports on both devices and plugged the board into an USB port. The board seems to work, but the TFT is just dead. On pictures in the internet I can see that there should at least light up a LED on the backside, but there is nothing. What have I to do to get it working? Hi, TFT 32 can be powered from AUX1 port by MKS SBASE, but MKS SBASE should be powered 12V. I just noticed that the TFT gets its 5V not from the USB but from the 12V that I had not connected to this time. I had the impression from some picture in the internet that the display would work with just USB power from the board too. Now with 12V attached it works. Will the TFT28 work with a RUMBA board to replace the GLCD display? Can be added in the future firmwares the “motion” menu? I would like to use a sketch of Marklin from another source. What is different about your version? Can you provide the code and where it goes so I can put it into another version? I am using the tft 3.2 controller. Many thanks! the newest marlin version is https://github.com/MarlinFirmware/Marlin. You can research marlin firmware on github. Sorry, forgot to add that it is on an MKS gen 1.4 board. Where can I safely download a copy of the Image 2 LCD program? I’m confused with your word. Do you mean you want the firmware for the 2.8″ LCD? If so, you can follow the instruction and download the firmware for this. If you want the marlin for the 3D printer, you need to according to your 3D printer and config the marlin. I found it here this evening.. I just assumed it was an upgraded version, but now I’m reading that they are completely different boards. I ordered the SBASE because I wanted to run smoothieware. Am I correct to assume that I can not install smoothieware on the MKS BASE v1.5? Additionally, when I ordered the v1.3, I also ordered the MKS-32TFT. Can I use this LCD with the v1.5? This is so confusing. 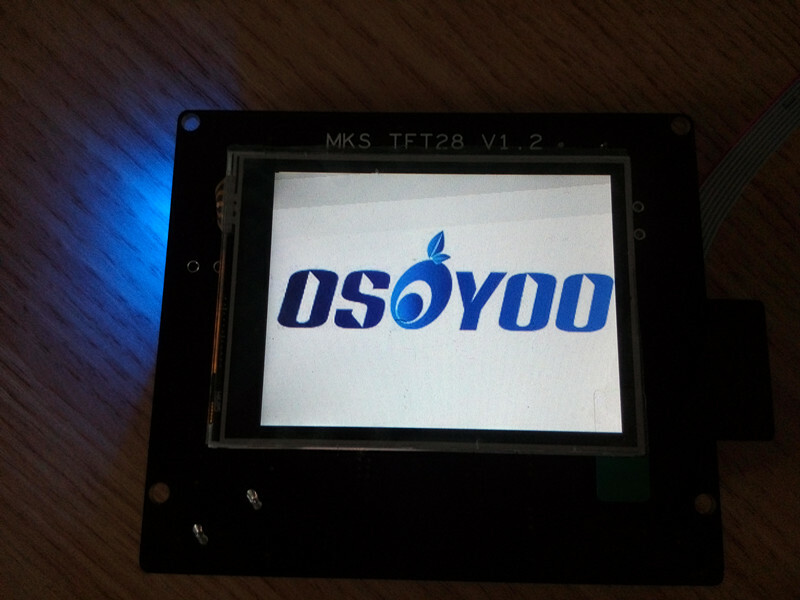 The MKS-32TFT can work with BASE V1.5. Do you mean you get the wrong board or you order the wrong board? Are you willing to provide the tracking number? Elaine, I should clarify that I ordered the SBASE v1.3 from a seller on Amazon 4 months ago, but received the wrong board. I haven’t had a chance to start setting it up until now. Is it still true that the 32TFT in not compatible with RAMPS 1.4? If it’s not compatible with RAMPS 1.4, then can I install Smoothieware on the BASE v1.5, or can you tell me what my other options are? My new mks tft32 touch screen is only showing one extruder.I have a tevo tarantula with dual extruders.Is there any way to show both extruders on the screen please? I’ve just done that,and it still shows 1 extruder on the screen. When I bought this screen it said it was easy to install—-IT IS NOT.Sometimes it manages to “home”,but it will not print anything. is him possible to connect version2.8 on a card megatronics V3? I’m sorry I can’t test with this board. But I find it is samilar with the board of MKS Gen which works with the 2.8 LCD. On the board MKS Base 1.5, can we use both the MKS TFT 3.2″ & the original Anet A6 12864 lcd ? Hi, I’m using a MKS SBASE v1.3 to control a CNC, not a 3D printer. Is the source code of the TFT32 available somewhere? Because most of the current menus are useless to me and I need to reconfigure my TFT32 to more useful functions for my CNC. How can I set up to show 4 extruder. I am running the kraken on my machine which uses 4 extruders. Hi. I just got a new FLSun Cube printer with the TFT32 screen and the mks gen l v1.0 main board. When I changed the custom loading graphic from the standard RepRap logo to my own graphic following the instructions in the guide, I get an FLSun logo overlayed in the middle of my graphic. Where is this logo coming from? I purchased 2 of these. One to use on a Smoothieware board and the other to use on a Rambo 1.1 printer. I didn’t realize this had different connectors than those on the Rambo. Is there an adapter which will permit me to use the KINGPRINT 3D Printer Controller Board MKS TFT32 with a Rambo 1.1 board? looks to me like in the ide I have to choose an Arduino vers. – which one should i choose from the Arduino list?